This vehicle is located at Ron Tonkin Alfa Romeo & Fiat. Please call 503-203-4600 to learn more! 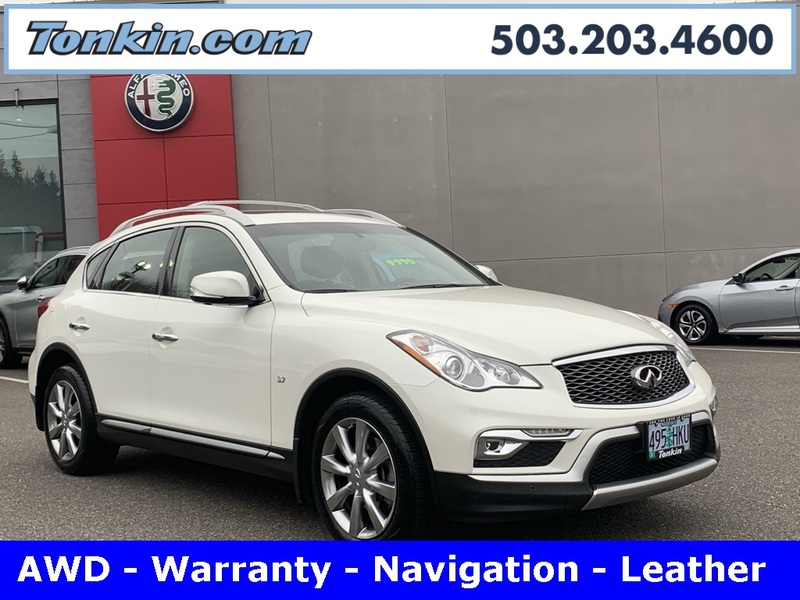 One Owner 2016 Infiniti QX50 White, SUV, AWD, Warranty, Premium package, Navigation, Leather, Moon Roof, Backup Camera, Parking sensors, V6 engine, automatic transmission, AM/FM/MP3 Stereo, Premium sound, SiriusXM Satellite, Bluetooth wireless, air conditioning, dual power seats, Heated seats, cruise control, tilt wheel, power steering, windows and door locks, dual front and side air bags, Front and Rear Head Curtain air bags, 4-wheel ABS, traction control, stability control, Keyless entry, Keyless Start, Fog lights, Rear spoiler and alloy wheels. Call today and schedule your test drive.